Technology Services for the Financial World! When should a company use servers in a cloud and what basic features should one look for before buying such services? To a customer, the main advantage of using cloud servers is that the basic day-to-day tasks of keeping the server running, such as providing properly air-conditioned and secure data room, redundant power, and network connectivity, are all outsourced to the service provider, and the customer pays a monthly fee to receive that service. The service provider can provide additional services, for a fee, to upgrade the server resources, install the server software and keep it up-to-date, protect it from viruses and security attacks, backup the data stored on the server, and so on. For small firms who want to reduce their initial capital expense usually choose Infrastructure as a Service (IaaS) model offered by cloud services. Midsize firms should evaluate their available IT resources and the cost structure to determine the best approach. 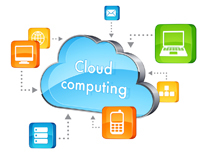 Contact CAPITAL at sales@capitaltechllc.com for information about selecting cloud services for your business. Software as a Service (SaaS) model has finally arrived for Office tools, but it may be difficult for users to decide which office product best suits their needs. The leaders in this space are Microsoft Office 365 and Google Apps for Business. Microsoft Office 365 gives you a complete set of tools, so you can work offline as well as online. 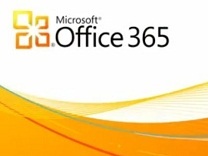 It offers packages that include full versions of Microsoft Office products in their subscription. Google Apps for Business offers basic set of tools, but does not include software like Microsoft Office. Companies that rely heavily on Microsoft Excel may want to stay with Microsoft so their spreadsheets do not run into compatibility issues with Google spreadsheet application. Google Apps for Business costs $5 (per month per user), whereas Microsoft Office 365 offers several packages at different costs: basic package at $6, package with corporate Active Directory integration at $10, and enterprise package with Microsoft Office Professional software at $24. Contact CAPITAL at sales@capitaltechllc.com for information about selecting online office software products. 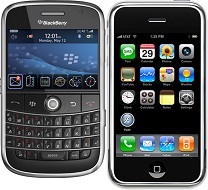 Blackberry is still the preferred choice for most business users, but Apple iPhone is rapidly gaining share in this market. RIM, the maker of Blackberry, provides server solutions so enterprise-wide policies, especially policies pertaining to security, can be applied for all users. Apple currently does not provide such a robust policy engine for iPhone. For this reason, the IT departments prefer Blackberry for their users, as it gives them much better control over the devices. Contact CAPITAL at sales@capitaltechllc.com for information about selecting mobile devices for your business.